Not sure what to do with your hair this summer? Don’t worry, our style and color experts Deanna and Alma have the answers. 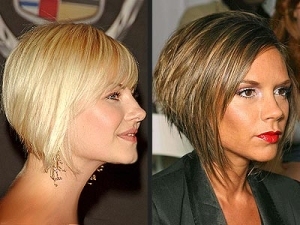 According to Deanna, there are great options for both long and short styles. If you like length, really long hair with heavy bangs or soft side fringe is the way to go. Women with small or low foreheads should avoid heavy bangs while pretty much anyone can wear side fringe. “But it really has to be blended, angled, and softened in a correct pattern, or it becomes a chunk of hair that disconnects from the rest of the haircut,” says Deanna. Since bangs grow out very fast, Deanna has her clients return in a week or two for a trim free of charge. She advises that you ask your stylist if a courtesy trim is an option. For those who prefer shorter hair, very geometrical sharp lines are in. “This type of cut looks sophisticated, and it can really open up your face and bring more definition to your eyes,” says Deanna. This style is also very low maintenance if you already have straight hair because the cut wears itself. For a night out on the town, dress your hair up in curls. Start off by shampooing and conditioning hair with products from the Kerastase UV Defense line. Towel-dry or scrunch hair to eliminate excess water. Apply a mixture of Unite Blow & Set Lotion and Unite Liquid Gloss to tame frizz and to get shiny, bouncy hair. Once hair is dry, use a medium to large size barrel curling iron. Leave iron in hair for a second and remove. If you prefer a tight curl, leave hair as is, or run your hand through the curl with Unite Second Day Finishing Creme to loosen the curl. When it comes to color trends, dark hair is all the rage this summer. “It’s not lighter this year, it’s edgy and daring for the summer,” says Alma G. Trendsetters who have gone from blonde to brunette include actresses Jessica Simpson and Cameron Diaz. Alma says Diaz’s very deep medium brown hair brings out her beautiful cheekbones and eyes, and makes her look classier and sexier. Another advantage is that darker hair makes skin look more tanned like you’ve been to the beach. Since the sun’s rays and ocean water can damage and fade hair, Alma recommends using coconut oil to keep hair healthy. Saturate hair with coconut oil from 20 minutes to 2 hours, tie hair in a ponytail to keep off face, and shampoo and condition. Repeat 1-2 times a week. Wigs are a great option for women who want to experiment with color and style without making a commitment. “This is especially very popular among African-American women and because they’re no more than $60, they’re very affordable,” says Alma, who is renown for her wig-cutting techniques. Hair Tip: For more great hair tips, email Deanna and Alma at askourpros@fushionmag.com.